If your system is under Warranty do not attempt this repair! 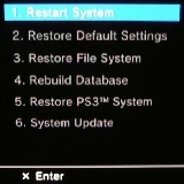 Send your system to Sony for repairs! PS3 BGA fluxing is generally only necessary when you have had to reflow a console more than one time. It will not hurt though, to use this process, for the first reflow of your system and can be greatly beneficial if the system had extreme overheating issues. Flux generally performs two operations. First, it helps prevent corrosion of the materials joined by the solder and secondly, it acts as a wetting agent allowing the solder to form a better more tension free bond. The reason it becomes necessary to use flux is that the flux gets burned off every time the solder is heated up to do the reflow and this leads to the solder joints drying out, cracking or becoming oxidized. Gilksy has provided another excellent video guide covering proper fluxing of the bga's. Also, at the end of the guide he covers bending the bga clamps for better contact with the heat sinks. Simply use this guide, in addition to the YLOD Repair Guide, to complete your repair. If you found this guide useful and would like to donate. Please follow this link to gilksy's youtube channel and you will find a link there to donate directly to gilksy for his excellent work and continued research into the PS3.